One of the few organizations engaged on the selection of the new Executive Director of UN Women is the Association for Women in Development. 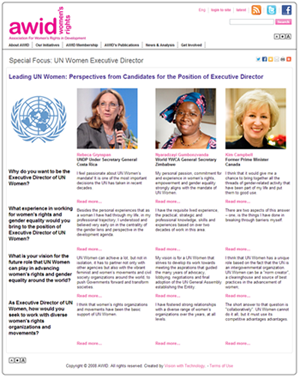 AWID has interviewed 3 of the 4 confirmed candidates for UN Women Executive Director. Since the close of nominations, they have reached out to the four confirmed candidates and invited them to share their priorities and hopes for the organization if they are selected. Three of the four responded — Kim Campbell (Canada), Rebecca Grynspan (Costa Rica) and Nyaradzayi Gumbonzvanda (Zimbabwe). Only Patricia Francis (Jamaica) did not submit a response. The responses from Campbell, Grynspan and Gumbonzvanda were published today on the AWID website. Why do you want to be the Executive Director of UN Women? What experience in working for women’s rights and gender equality would you bring to the position of Executive Director of UN Women? What is your vision for the future role that UN Women can play in advancing women’s rights and gender equality around the world? As Executive Director of UN Women, how would you seek to work with diverse women’s rights organizations and movements? AWID notes that Lakshmi Puri and Tarja Halonen, rumored to have been under consideration, did not put their names forward as nominees. The remaining unconfirmed candidate is Radhika Coomaraswamy, former UN Special Rapporteur on Violence Against Women. Of course, there could other candidates whose nominations have not been made public but whom the Secretary General and his senior appointments teams are considering. As the process and timeline is being kept very quiet — not even UN Women is privy to much of the discussions — it is likely that how these and any other candidates are evaluated against the announced criteria will remain unknown. It is possible that some interviews with the candidates have already taken place and that one or more of the candidates have been eliminated from consideration. But the lack of openness in the process prevents women’s groups or other stakeholders in the success of gender equality efforts by the United Nations — including UN Women itself — from having any say in the matter.